I have a small but loyal following here and wanted to give you guys an update. My web development company decided to try to launch 3 websites (in one week) at about the same time I’d planned to launch my book. Since we have to eat, we chose to be zen about the book launch. Had to be done. Push it back. Long-Suffering Editrix® is still line editing, so it made sense. Then stuff happened. I shared some of this with my ARC team, want to share it here too. I’m just going to copy most of what I sent them. They read for me so they got this news early. Regurgitation follows. So where’s the damn book, Anne? Well, it’s been delayed a bit. I cannot say too much about it but i will say that some doors opened for me in the traditional publishing world and when Long-suffering Editrix® finishes with her line edits, I shall be pursuing those opportunities. In the meantime, I’m building out my book website and also working to establish connections with book bloggers. My friend Rob has a role playing game company (not video game, think D&D). He is now getting it off the ground and he wants to use my world as a sourcebook! Think D&D module. I’ll be working with him on that after launch. BUT you guys need to go check out his game system. If you sign up as a playtester you might get to play with me! 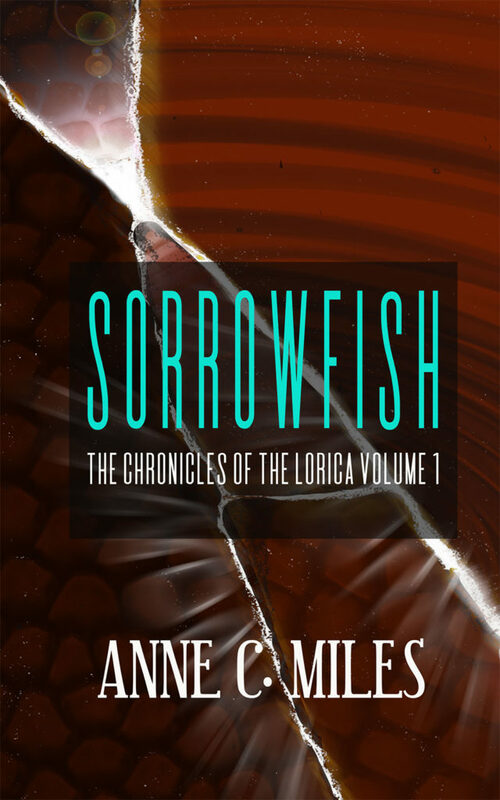 I submitted 30K words of Sorrowfish to Deep Magic Ezine months ago, in a fit of defiant hope. Things were not going so well around here and it gave me something to focus on. I knew darn well my novel excerpt wasn’t a fit. You know what? I think JEFF WHEELER himself read it, three times. And he gave me great feedback. I was so stoked. So you, my lovely actual followers, get to see what he said. This is a novel excerpt. I hate doing this, but I really wanted to submit something and I read an issue. You had a novel excerpt, so I decided to try. This follows Trystan, a bard-in-training and tells how he obtained his magical lute and became part of a shadow network. It also follows the adventures of the luthier himself, Dane. THE RESPONSE: Thank you for your submission to Deep Magic. We know it can be stressful waiting for a response and we strive to be as prompt as we can. We are going to pass on your submission “The Lute”, although we do appreciate you considering us. Writing is very subjective and just because we didn’t select this piece doesn’t mean others won’t. Most publishers don’t provide feedback, but we try to. First, we don’t normally consider works of this length, for a host of reasons. Still, it never hurts to ask, and in this case, one of our First Readers agreed to take this on. His interest was piqued after he saw this on your website, “If the Darwath Trilogy by Barbara Hambly and The Name of the Wind by Patrick Rothfuss had a weird love child raised by Terry Pratchett, you’d have this book.”. In his view, this story lacks the snarky and irreverent tone of Pratchett, or the building horror/dread of the unseen enemy in the initial Darwath books. Some elements in common with Rothfuss are present, but of course this lacks the same narrative voice. In short, the description sets expectations this story doesn’t measure up to, though it shows promise on its own merits. Our First Reader, then reread this story two further times, attempting to set aside those expectations. Thematically, a world of magical music is intriguing and little used, its premise offered here to good effect as the source of growing discordance was slowly revealed. As a short work, however, this story attempts too much. There are too many characters, too many races, too many unspoken and only hinted interrelationships to be satisfying and well developed. Over the course of a trilogy, greater insight might be offered and mysteries uncovered, but this piece doesn’t have the tight focus to immediately grip and keep a reader sitting down with the expectation of something shorter than an epic. Additionally, the transition between focus characters was abrupt and, frankly, discordant. The relationship between the two felt lacking and emotionally disconnected – something perhaps resolved by interspersing their individual chapters or emphasizing the emotional connection to the lute, sought by one, and crafted by the other. Critiques aside, our First Reader did enjoy the excerpt, and extends his hopes that you continue to refine the work in the future. It just wasn’t the right fit for us. Thank you again for submitting your work to Deep Magic. You are always more than welcome to submit something else in the future so long as it meets our guidelines. I just want to say thanks!!! I was gladdened to see another reader of Darwath. So much in that period has not found publication digitally, and is being slowly forgotten in the mists of history. Keep the flame alive. …and if you should have a moment of inspiration which results in a tight, vibrant story of fantasy or science fiction with a character focus and a clean read, keep Deep Magic in mind for your future submissions. GUYS THAT WAS JEFF WHEELER!!!!!!!!!! Had to be. SWOOON!!!!!!!! Fanning myself. Deep breaths. Ok, so that was cool. And if you don’t know who Jeff Wheeler is, shame on you. But here’s the link to Deep Magic. And here’s what they said after I gushed about the whole thing on on Twitter. As one does. So there you go. I’m very humbled. Very grateful. Part of me wants to send them the whole book as a thank you gift…but I’m not going to pester. And that’s really the latest. I’m launching two more client web sites so no new writing news. My book website (which is separate from this writing blog and will in large part, replace it) shall be built as soon as we are done with these two projects. I’ll let you know more when I know more. Pray for Long-Suffering Editrix®. She needs it. She has to deal with me. I will get Sorrowfish launched someday. Don’t really expect the traditional publishing lanes to pan out. I’m just being realistic. My book wasn’t written to pander to agenda fiction consumers and I am not super hopeful that the trad houses are buying anything else. I hope I’m wrong. But since the doors opened, I’d be an idiot not to see what happens. And until I’m caught up on the day job, no writing. oh yeah, the one other bit of news? I have a new cover idea. LOL. PS. Tried the cover idea. I don’t think I like it. But at least I got the idea out of my head.